I got a promo poster postcard. Neat! So I'm heading down to the lowest level of the Javits Center on 34th Street last Sunday, weaving my way through anime nerds, comic nerds, sci-fi, steampunk and just your general, cheese-scented nerds attending the last day of New York Comic Con/New York Anime Festival. I'm heading into the IGN theater for the last big panel/screening of the weekend, a Q&A with Robert Kirkman, creator of award winning comic series The Walking Dead, along with Fred Darabont and Gail Anne Hurd, executive producers and series adapters for AMC network's television take on the Kirkman's books. A cute blond girl in a NYCC "Con Hero" yellow shirt is getting exasperated corralling geeks for the event, so I just strain my ears and follow the unwashed masses rather than ask her again for specific directions. Obviously this does not work. I head over to a different yellow-shirt and ask him where to find the theater. The third day of the con, I am no longer clad in a tank top and a glowing, Iron Man chest piece. All this guy sees is a guy with glasses in a t-shirt and styling jacket. Oh, and a press badge. He sees that press badge and immediately ushers me through the black curtain behind his back, down a hallway to which just yesterday I had been denied access. I love my press badge. I head through the maintenance hallway until I come out in the side of the massive auditorium. I take a seat as close as I can to the stage and in the middle of the two massive movie screens to either side. About ten minutes later somebody comes on stage asking all of the press gathered–about a third of the room already–to make sure we fill in the front seats because there are several thousand fans about to shuffle in. Have I mentioned how much I love my press pass? The big draw is footage. At San Diego Comic Con this past Summer, AMC released the first trailer for TWD, but today there has been a promise of actual scenes. Host Eric Moira quickly introduces Kirkman, Darabont and Hurd, and then informs the enormous crowd that there is nothing he can do to stall so many people, so they are just going to show the first scene immediately: six-and-a-half minutes from the second episode. The screen dims and what follows is a wonderful 390 seconds. Without spoiling anything (I'm sure this footage will be online shortly), the crowd erupts in cheers when a certain young Asian man makes his first appearance. To be fair, the resemblance to his (entirely fictional) comic counterpart is disconcertingly precise. There are many cheers for familiar characters, but there's also an incredibly groan let out at a particular zombie take-down. Which raises an interesting point. 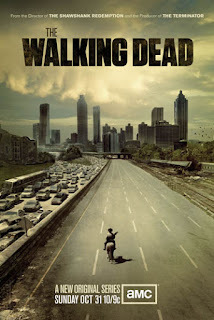 How the hell is this show going to handle the gore of zombie killing? They're not people, not animals, not even alive. Does the FCC have a policy for what you can show on television when the critter's already dead as all get out? Maybe, but zombie killing is maybe 5% of The Walking Dead. People killing and extreme emotional talks are the rest. Surely AMC is going to have to do something to censor such an (awesomely) graphic series. Not so much, says Darabont. "Remember, this is the network that makes Breaking Bad. And Madmen." Trying to explain the series' content as closer to an "R" movie rating, the analogy eventually breaks down and he just says, "Breaking Bad … we're going to make them look like pussies." Kirkman, who has also penned the script for episode 4, adds, "People will be shocked at the level of … stuff we can get away with." The two describe their disbelief at emails of energetic approval from Standards & Practices, then renege, saying the bosses were there and that S&P were doing their jobs very well. The actors introduce themselves and their characters, Yeun being cheered, Bernthal being openly booed by fans who have read the books. He laughs, and actually thanks New York. Apparently he was expecting such a reaction from San Diego and was rather disappointed when he didn't get it. He does, however, add that maybe those of the audience who booed will feel a little differently when they see how his character is fleshed out on air. 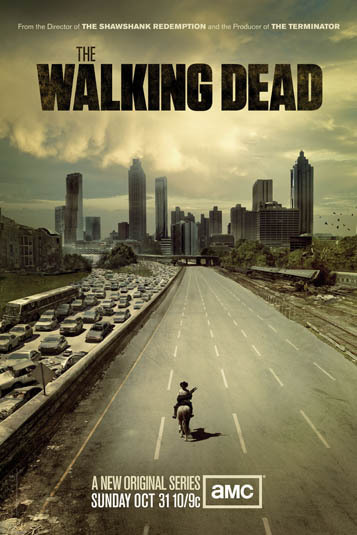 The Walking Dead premiers at 10 p.m. (EST) on Halloween night. It is 90 minutes, half and hour longer than a regular episode. However there are only six episodes in the entire season. Why would AMC green light a show for only six episodes? Well, they're partially playing off the English method of T.V. broadcasting. They're not short changing the show by demanding they snag a massive viewership with one pilot episode, something some shows never make it past if they air their pilot at all. Instead, AMC is giving the series six episodes to bring in the fans they already know the book has. Basically, they're hoping everybody tunes in for the first six weeks, because if even half the audience for the comic watches the show they are going to smash some season one basic cable records. Kirkman and Darabont plead with the audience to get everyone to watch live. There is no benefit in watching online or on DVD with this one. From the get-go, people need to tune in if they want to see a longer second season. And why not? The show is going to look pretty amazing. According to Darabont, they chose film and cameras that would make the zombies look as disgustingly realistic as possible. "We shot on actual film," he adds, to surprisingly celluloid-knowledgeable applause. "Super 16," in fact. This gets significantly less applause, but those who do clap are very enthusiastic. Kirkman, for what it's worth, adds that the first time he was told all this it flew completely over his pencil-and-paper head. The long and short of it is, these zombies are going to look incredible and they're probably going to re-die in some pretty visually visceral ways. If you want to hear more about The Walking Dead screening and a whole bunch of other Comic Con nonsense, I'll be co-guest hosting The Mild Mannered Podcast sometime hopefully this week.